Actually, two types of fish are referred to as the Dover sole. The common sole, Solea solea, is a flat sole fish found in the North Sea through to the Mediterranean. The Pacific Dover sole, Microstomus pacificus, is found in the Pacific Ocean and is actually more closely related to the flounder. Both fish are used for cooking, with the European Dover sole being the more expensive. Pacific Dover sole was named after European Dover sole in order to boost its popularity. The website of the Seafood Choices Alliance, which promotes sustainability for the seafood industry, reports that the fish is of lesser quality than the original, lacking thickness and firmness. The European Dover sole is acclaimed by food experts for its sweet and buttery taste and meaty texture. British chef Gordon Ramsey refers to it as “the Rolls Royce of the fish world.” European Dover sole is celebrated because as a cooking ingredient it is versatile and firm. The fish is also said to be simple to debone, so it is easy to prepare the fish for cooking. 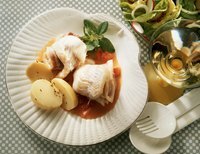 Dover sole is a white fish, meaning that does not contain the same high levels of Omega-3 fatty acids as most oily fish. However, according to the Foods Standards Agency of the United Kingdom, white fish are very low in fat and a good source of vitamins.